Tucked away in two cozy connected houses just north of campus is the University Press of Florida (“the Press” for short)—the official book publisher for UF as well as the entire State University System. View its offerings online or at its booth at one of a number of book fairs and festivals the team attends—most recently, last month’s Miami Book Fair—and you’ll find a mix of titles as eclectic as Gainesville itself. You might page through Norman Van Aken’s Florida Kitchen by Van Aken, whom Anthony Bourdain called “the big dog of Florida cooking,” or Gail Fishman’s Journeys Through Paradise, a book about pioneering naturalists in the Southeast. Or your interest might be piqued by former land manager Terri Mashour’s Backcountry Trails of Florida or John Capouya’s exploration of the histories of R&B, soul, funk and disco in the state in his book Florida Soul. The Press has cultivated a variety of book series grouped by subject, including the David A. Cofrin Asian Art Manuscript series, the Florida Museum of Natural History Ripley P. Bullen series, the Southern Dissent series and others. It also publishes the Gatorbytes collection, which highlights preeminent research being done by UF centers to solve many of the problems Florida faces, from hurricanes to water conservation. 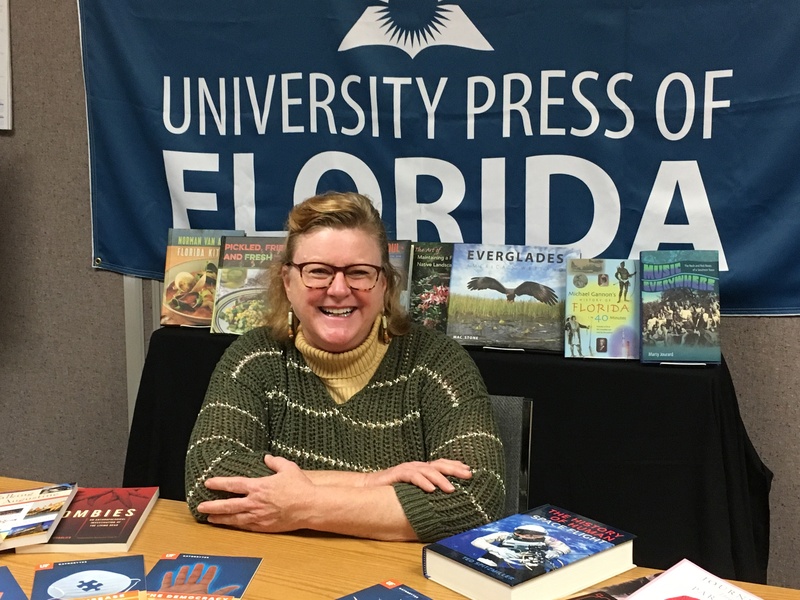 “Our Florida list really defines us, and we’re also a top publisher of archeology and anthropology books,” said Gutierrez. Perhaps the most well-known book on the Florida list is Michael Gannon’s The History of Florida, which is taught in classrooms across the state. The books the Press publishes don’t have to be about Florida or the Southeast though. For example, Ted Spitzmiller’s book The History of Human Space Flight isn’t about UF or the Sunshine State per se—despite UF’s designation as a space-grant research university—but the book serves the Press’s scholarly mission. Led by director Meredith Morris-Babb since 2005, the University Press publishes books on everything from art, natural history and technology to music, science and African-American history. These books are written by professors, researchers and others—some of whom are affiliated with UF and the state’s 11 other universities—as well as scholars around the globe. The Press doesn’t publish poetry or fiction. Founded in 1945, the Press brings anywhere from 80 to 100 books into the world per year and currently boasts approximately 2,500 titles in print. Its first book, Florida Under Five Flags by Rembert W. Patrick, was published in 1947 and is currently in its fifth edition. Prior to becoming director, Morris-Babb was editor-in-chief of the Press for eight years. She is also a past-president of the Association of American University Presses. Her team of roughly 30 people includes acquisitions editors, who reach out to scholars, receive and review book proposals, and facilitate the peer review process; editors, designers and producers, who edit and proof copy, design pages and covers, and get books ready to share with the world; the sales and marketing team, which works like mad behind the scenes to promote books and make sure audiences find them; warehouse and IT staff; and interns. The Press does everything in-house except physically print its books. A new book gets into the hands of the Press’s team in one of two ways: it is solicited by acquisitions editors or it comes in “over the transom,” or unsolicited. If the editors determine a manuscript (a book that is not yet published) or a book proposal (an idea for a book) is a good fit for the Press, they work with its author to make it a “top-notch manuscript,” said Gutierrez. From there, the manuscript is sent to one of two editorial boards for peer review—the gold standard for scholarly publications—which closely reviews the manuscript and offers feedback for improvement before official approval. The manuscript is then transmitted to the Editorial, Design and Production team, which works to create all of the book’s elements, a process that can take anywhere from six months to a year. All the while, the Sales and Marketing team is writing marketing copy, researching and creating keywords, planning events and other promotion, and contacting major distributors to give the book the best chance of success when it’s released. Though it’s a challenge to boil it down to only one or two upcoming releases, Gutierrez says she is excited for a cookbook coming out in the spring called Coconuts and Collards by Von Diaz, a Puerto Rican-born and Southern-raised writer. “The author grew up in Atlanta and she has fused Atlanta recipes with her Latina roots, so you get this tropical-Southern blending of flavors,” she said. There’s also Phil Gernhard, Record Man by Bill DeYoung, the story of the Sarasota-raised music producer whose Tampa studio helped launch gold records and bands in the ‘60s, ‘70s and ‘80s. The University Press of Florida is currently holding a holiday sale. View its holiday gift guide here or upress.ufl.edu to learn more.